Experience: The company is very knowledgeable in building helmets and are highly regarded. Producing with the highest of technical endeavor and long standing reputation. Interesting Facts: In the 1960s the company started to produce the first motorcycle helmets in Tokyo. Color: A variety of different colors available to select on this model. 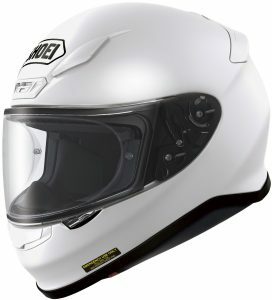 The Shoei RF-1200 Helmet has a compelling new improved shield system with its advancements in aerodynamics. Thus allowing the rider to experience a very quiet and enjoyable riding experience. One of the interesting designs of this helmet is the improvements of the motion of the rider’s neck. This allows the motorcyclist to check for traffic from behind.